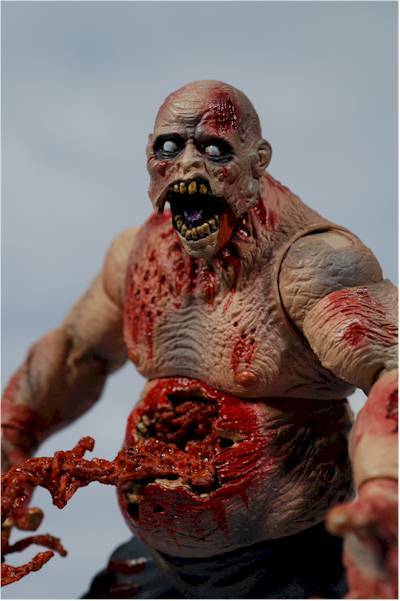 Just a couple years ago, you couldn't find a zombie action figure to save your life. Fans clamored for something, anything, that was walking dead. And companies responded. 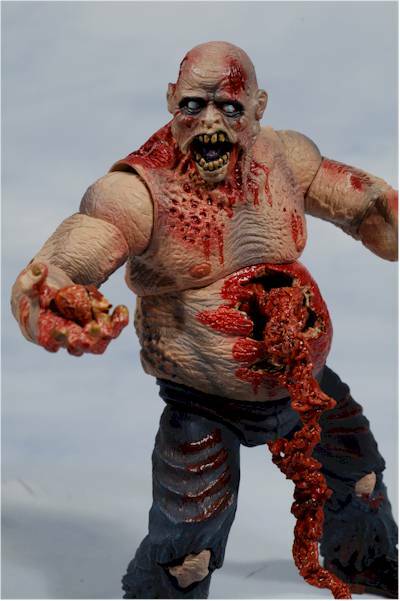 We've gotten two Dawn of the Dead zombies from NECA, and Sideshow has given us two zombies in their The Dead series. 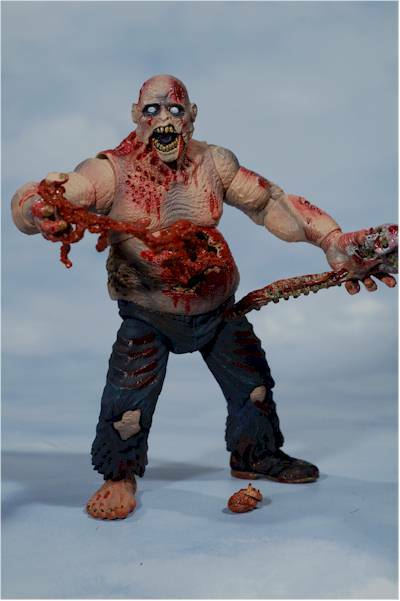 SOTA has several figures from Land of the Dead in the pipeline, and Mezco has just released their line up of Attack of the Living Dead. 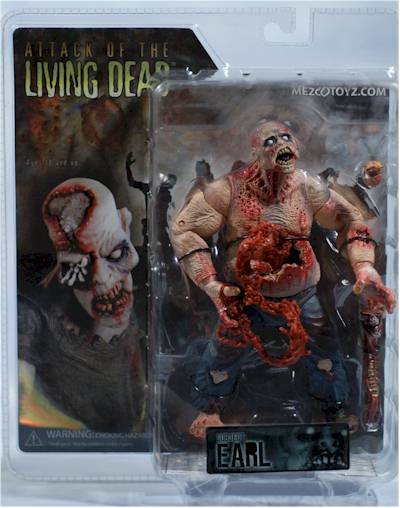 Actually, this isn't the first zombies we have gotten from Mezco in the last couple years. 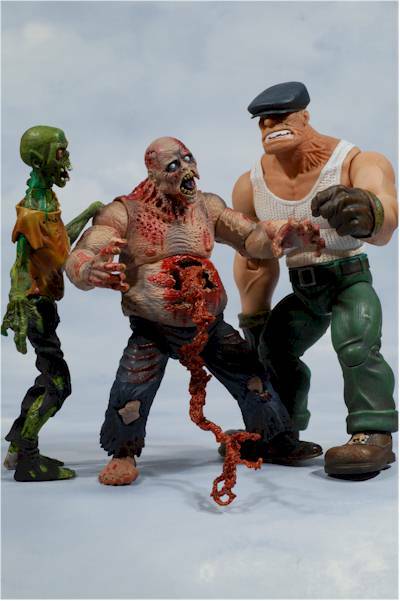 They did the Goon series about a year ago, including a 'build a figure' zombie that came packed in pieces with each figure. Of course, the Goon series was done in a comic book style, like the artwork, and it should be no real surprise that the new ALD set is also somewhat cartoony. These aren't done in a caricature style, like some of their lines, but rather in a very comic book style, fitting in quite nicely with the Goon style. There are three characters in the first series, Jake, Hellen and Earl. I'll be checking out Earl tonight. Oh, and if you were concerned about variants, don't be - there's so many you won't actually be able to keep track without your Blackberry imploding. There are four color versions - a dark set and a pale set that are available at stores, a glow in the dark set available only through ClubMez, and a black and white set only available through Mezco Direct. On top of that, each character has head sculpt variations. I believe there's only two heads for each character, but Mez might surprise us - you never know. So if you're a completist, I pity you. You'll need to pick up at least 24 known figures at about $16 a pop. Ouch. As I mentioned, I've just picked up Earl so far (I think my complete set will either be the B/W or GITD set), and he's the pale version with both eye balls in tact. I grabbed him at Hot Topic, but I have some online suggestions at the end of the review. Standard clamshells, and I like them for all the usual reasons - nice presentation of the figure, sturdy, little chance for shelf or shipping damage, relatively easy to store for the MOCers. I also like that rather than go with the cheaper, thin paper inserts, Mezco is using a stiff cardboard insert. There's also some decent text and graphics with a basic run down of the line. A little more around the characters would be cool though, maybe an inserted backstory? Earl sports two head sculpts, and I saw both at the local Hot Topic. One, the one I selected, has a jointed jaw, with dead white eyes and exposed teeth. The other has one eyeball flopped out of the socket, a mouth sculpted closed (I believe - best I could tell from outside the plastic coffin), and slightly more damage to the skull on the side. The popped eyeball just wasn't working for me, but this one was excellent. The teeth were particularly grotesque, and there's wonderful detail on the sagging, rotting skin all over the body. Earl also has a bit of a tummy ache. His beer belly is cut open wide, and his own intestines come as an accessory. 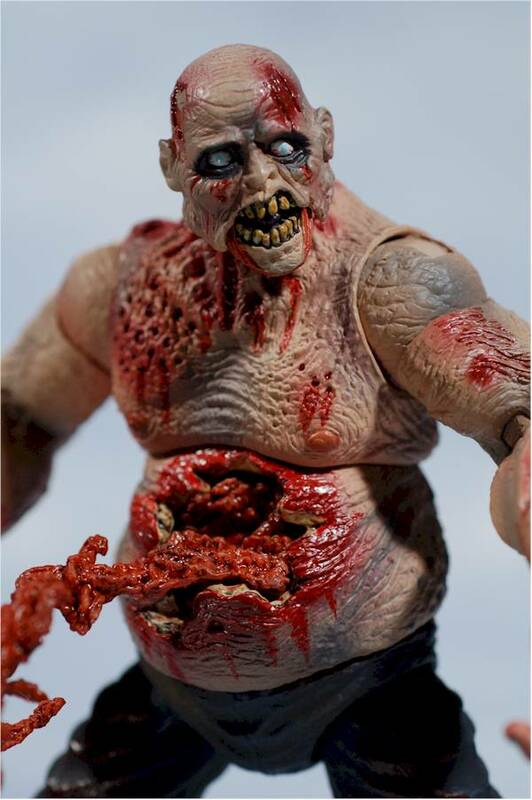 While the interior of his stomach isn't extremely detailed, it does give you the impression of human cavity, and there's plenty of gore to go around. The sculpt and articulation work well together for the most part, and his scale works pretty well with 7" figures. He's a little small for 8" figures like Goon and Hellboy, but you can always just assume he's a short, fat bald guy. However, his style works extremely well with both those comic book based lines. The paint works in concert with the sculpt for the most part, improving or adding to his overall appearance. The work on his face and head is the most striking, with a nice decayed look to the teeth, and an almost glowing white used on the dead eyes. There's a fair share of blood of course, but considering the subject matter, it's not overdone or excessively fake. His skin tone looks great, although I think he's well past any help from the rejuvenating effects of Oil of Olay. If there's one issue, it's with the blue jeans, which have a bit more black highlighting on the tops of the folds than I'd like. Still, it's a minor nit of an otherwise great looking paint job. Earl has some good articulation, especially for a zombie. He has a ball jointed neck, important for all action figures, and it has a decent range of movement. This particular head sculpt of Earl also has a jointed jaw, so it can either be open or closed. On mine, the jaw does tend to fall off pretty easy though, which might be a feature or a pain. Hey, parts tend to fall off zombies and lepers. It's just one of those things they learn to live with. He also has ball jointed shoulders and hips, pin elbows and knees, ball jointed wrists, and very cool ball jointed ankles. The ankles allow for a ton of interesting 'busted zombie ankle' poses, and have a lot greater range of movement than you'd expect with the pant legs. The only major joint issue is the shoulders. These figures appear to have 'break apart' action. What this appears to mean is that the arms pop off pretty easily at the arm side of the shoulder ball. While that sounds moderately amusing, it really means that the peg on that side of the ball is fairly short. The ball joint on Earl's left arm is also very tight and difficult to move, and whenever you attempt to do so with the left arm, it pops right off. Annoying, yes. Amusing, not so much. Earl comes with three accessories - a bloody heart, a skull connected to a spinal cord, and his own loose intestines. I think this is a case even House can't fix. I'm assuming the heart belongs to someone else, and clearly the skull/spine combo does. These are both good sculpts, although the heart is a tad small scale-wise. He can hold them in his hand, and there's some interesting depressions on the skull that actually work with his fingers to make holding it a little easier. His own intestines are sculpted from a softer, gooey-er rubber, giving them an appropriate ick appeal. There's some loops sculpted in one end that fit over his fingers nicely, making it possible for him to actually hold one end tightly in hand. The other end can be inserted into his open stomach cavity, or placed in his hand or on the ground, depending on your mood. Okay, these aren't exactly toys I'd give a 5 year old. But a ten year old? Oh, Hell yes. Kids that age love the gorey and gross, and the comic book style of these works to keep them from being too 'serious', and more like the old EC comics version of horror. Hey, zombies are fun! Ouch. At $16 a pop, these are not a value. Now, you can find them closer to $12 online or in sets, and at that price you can add another half star here, bringing them up to the industry average value. But if you're shopping at Hot Topic like I was, you're going to feel a serious pinch on the wallet. Not much. I doubt you'll have to worry much about paint ops, but you might want to shop around for your favorite color/head combinations. 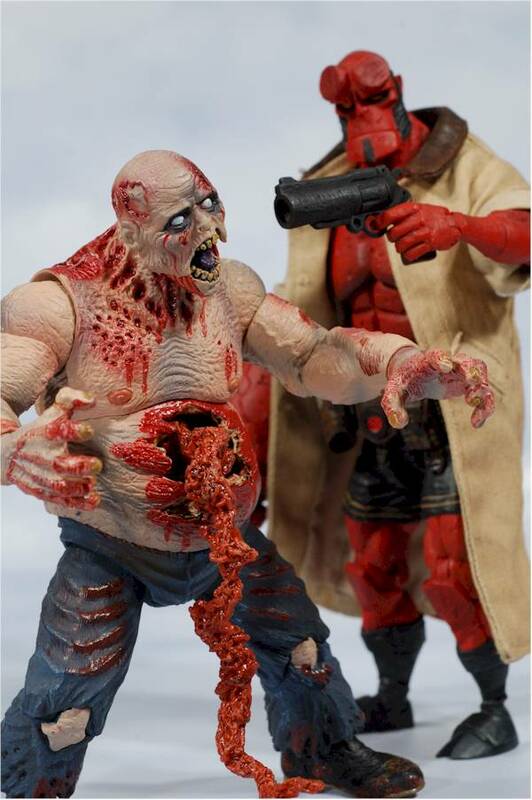 If you're looking for some zombies to joint your comic Hellboy and Goon displays, then this is the perfect line for you. Some folks may be put off by the comic book approach, rather than a purely realistic approach, but it works for me here. That's largely because I love the Hellboy and Goon lines so much, and am always up for adding some more characters, even if they are just generic zombies. At $16 a pop though, the going rate at most brick and mortar stores that have these (including comic shops), they're too expensive. Pick them up closer to $12, and you're getting a more appropriate value. Better yet, pick them up at that price without paying shipping, and you can add another half star to the overall score. - CornerStoreComics sells a case of 12 for $145 (about $12 a figure), which will get you both pale and dark versions of all three, probably in both head sculpts. They also sell a set of six, three pale and three dark, for $75 ($12.50 a figure), or singles for $13 each. - Amazing Toyz has the case of 12 for $145 as well, along with a set of 6 for $75. They have sets of three (pale and dark) for $38, or singles for $13. However, they've already sold out of many of the singles, with others very low in stock right now. - Cult Classics 4 has a Dawn of the Dead zombie, while Cult Classics 3 has another, along with Shaun from Shaun of the Dead. - And last year, we saw the release of the first Dust figures, including the zombie soldiers. 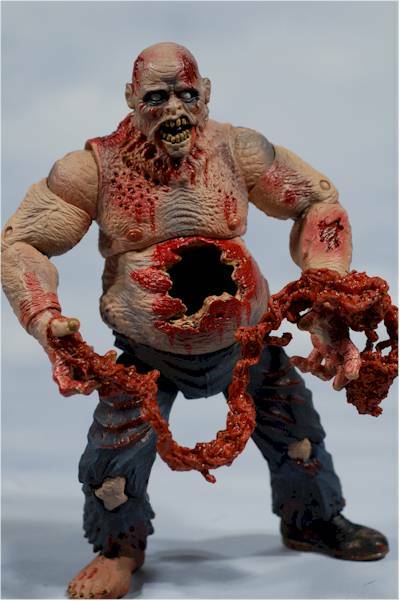 - Toybiz gave us a zombie in the recent Marvel Monsters boxed set.